This 10-day intensive speech therapy camp to work on motor speech is a fun and supportive environment. 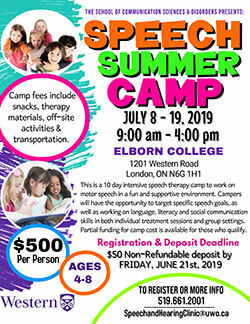 Campers will have the opportunity to target specific speech goals, as well as working on language, literacy and social communication skills in both individual treatment sessions and group settings. Partial funding is available for those who quality. Camp package (see below) and a non-refundable deposit ($50) must be received by the deadline.